Christmas has past and I sit her in the after glow. The games are being played, the new clothes have been washed and put away and until after the first of the year my little family will be together at home. Pure bliss, I tell you! I have been thinking about the passing year and the one to come for quite a while. I could sit here and tell you how tough 2016 has been, but I won't. Let's face it, we all have issues. Some days, weeks, months and even years are better then others. As many of you know I am an avid reader. A couple of months ago I was reading a book and one of the characters asked when a quilt would be finished. The other lady laughed and her response was that it wasn't about the finished quilt, but each stitch taken while making the quilt. I have been thinking about that since I read that book. Honestly, it was on my mind so much that I had to pull the book out of my sell bag and look for that conversation again. There is so much talk now about slowing. I would love to slow life down and honestly I do my best to keep my life slow and simple. The truth of the matter is that life is always moving. If we spend too much time waiting for things to slow down, for the last ten pounds to come off, for a task to be done or things to be perfect then we won't find joy in journey. Instead of a word for the coming year I will have a phrase... joy in the journey. No matter how crazy or stressful it might seem I want to savor the moments and find joy in journey. Not to be in such a hurry to get to the end of a task. As a believer I know what the end of my journey will be and my goal is to find joy in that journey. I will be spending the remainder of this year enjoying my family. I hope you will join me in 2017 as I strive to find joy in the journey! The past two day were a whirlwind of activity. We snapped a family shot before we ran out the door Saturday for a Christmas Eve luncheon with Chuck's mom. After the lunch and gifts it was time to celebrate a Christmas Eve birthday. There were 14 of us that had dinner at a steakhouse for my dads 67th year. We missed the Chistmas Eve church service and spent some time driving around looking at lights. There is no place like home! I love pulling into the drive and seeing our lights shinning out. Once Megan was asleep the rest of the gifts were brought out. Yes, that is a coconut you see. Megan will ask for one almost everytime she is at the grocery with me. I will say it isn't on the list or not in the budget. Now she finally has a coconut! We joined Chuck's dad for lunch and to celebrate his birthday. Yes, my dad has a birthday Christmas Eve and my father-in-law Christmas Day. How crazy is that! Then it was off to my parents to celebrate with my family. I know that some will read this and think it is crazy to do all of this in two days. I will admit that in the past I have struggled with it. A wise person told me to embrace it because life is short and as time passes love ones pass on and these times will be missed. That has stuck with me and changed my perspective. I enjoyed every moment with the ones I love as we made memories and celebrated the greatest gift of all - our Savior! All of the presents are wrapped. The sweet treats have been made, and now it is time to sit back and allow my heart to reflect on the true meaning of this wonderful season. What a gift that the birth of this sweet baby led to! There was a little bit of hustle and bustle around here. Thursday was spent caroling at a nursing home. It was quite eventful with a child passing out and another child not feeling well. Part of the issue was the fact that it was HOT! Besides that it is one of my favorite field trips. The joy that I see in faces of those at the nursing home is wonderful! Friday there was a half day of school scheduled. I ended up spending the entire time there. Breakfast was served to Megans' class. Another mom and I made pancakes (plain, chocolate chip and blueberry) to order. Then I joined the class for chapel. Each class sang a carol, the Christmas story was shared and I really felt ready for Christmas by the time chapel ended. Then it was party time! Games were played and then it was time for the gift exchange. This is the second year that Megan has had Mrs. A and we love her! So, so sad that she is retiring at the end of the year. Saturday Megan and I spent the day at my parents along with my sister and nieces for our annual cookie day. It is always a good day. We bake, laugh, watch Christmas movies and ended the evening with pizza. The cookie trays are packaged and ready for Chuck to share at work Monday. There was ice Saturday night and I can't say I was upset when Chuck said we were staying home Sunday morning. I was ready for time at home and some rest. We had a lazy morning, puttered around doing a little bit of picking up and listened to Christmas music. After dinner games were played and we watched a baking show that was recorded. Of course we had to enjoy a treat from cookie day while watching TV. After being away from home for several days and Chuck working Saturday this day is exactly what we needed. We are feeling refreshed and ready to face the week! 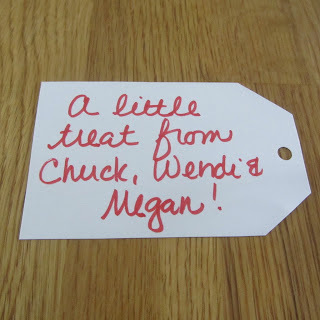 I found the cutest labels that I am using for my goodie bags. A little note on the back and then I tied them on with some ribbon. Aren't these candy cane cards adorable? 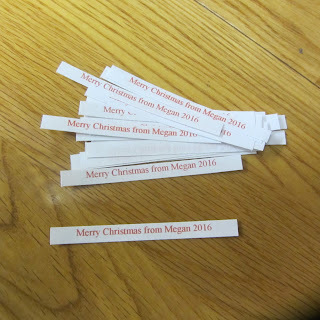 These will go to Megan's classmates. Megan saw this and asked to make one. I suggested we make it to go on top of her gift for the class gift exchange. Megan and I have been working on these ornaments. These will also be for her classmates. 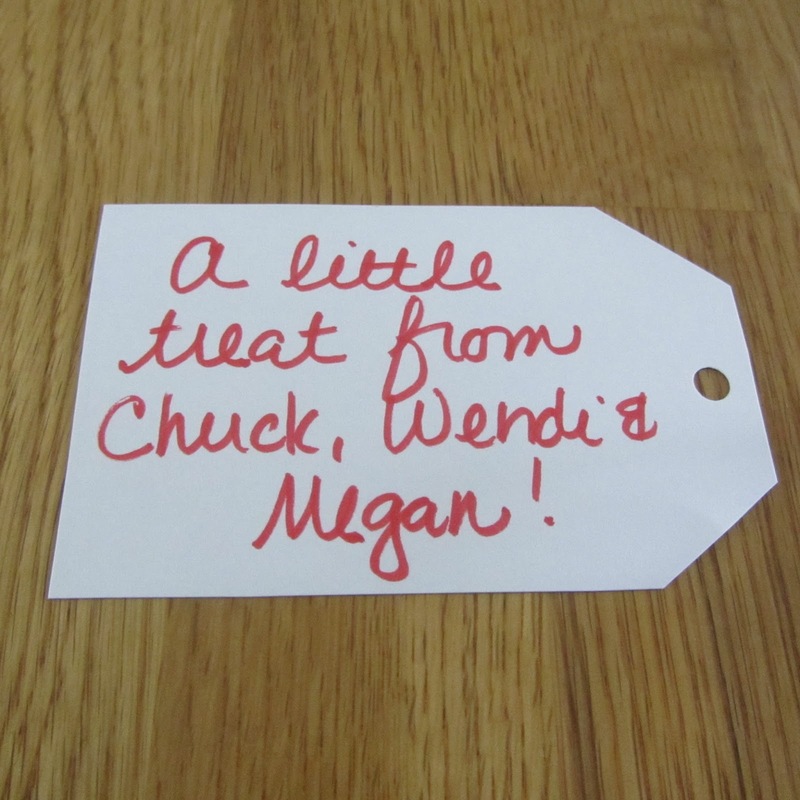 I made tags to go on the string of the ornaments. I don't usually make ornaments for classmates. This year is different for a variety of reasons. 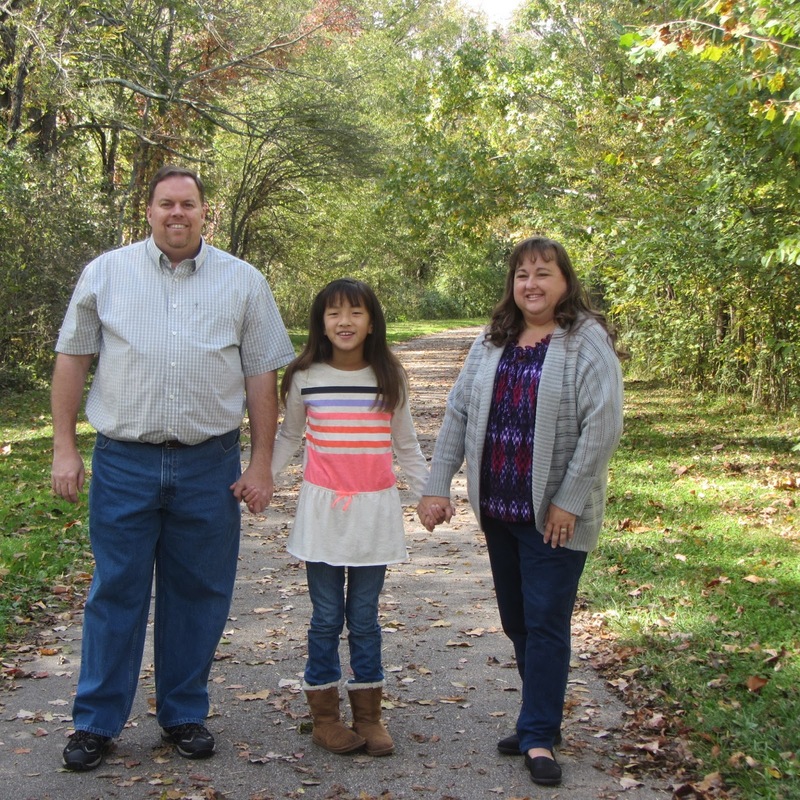 Many of the kids that Megan has been in school with since she was in preschool are leaving her school at the end of the school year. Middle school is good time to leave and transition into public school. 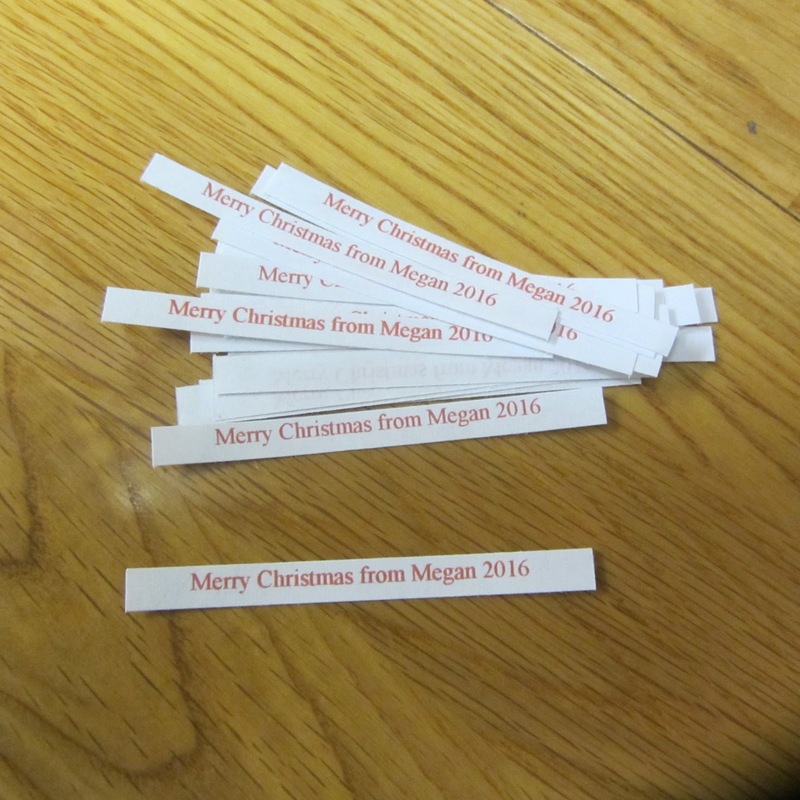 Also we aren't sure where Megan will be next year. I thought that this would be a great way for them to remember their time with Megan. The first snowfall of season has come. Saying it was beautiful is an understatement. The snowflakes were huge and it stuck to all of the tree branches. I was mesmerized and couldn't stop going out onto the back porch to take it all in. Even my feathered friends were out enjoying the beauty. Once Megan was home she went straight to her boots. She was ready to go out and play. Who could blame her! I was cracking up as she rode her bike around. I do believe this is a first around here! I couldn't let her have all of the fun so I put on my boots and joined in the fun. We created this snowgirl and then she helped me finish up my work. I had shoveled the driveway earlier and had planned to shovel a path from the back door to the trash can. Megan was having so much fun that she shoveled the entire section of the porch that isn't covered. :) By this point my face was cold so I called for time to return inside. It was a warm shower and fresh jammies for Megan while I made dinner. What a beautiful day!